Six cosmic stones can alter the galaxy and when possessed by one person they grant unlimited power. In Infinity Wars #1 the six stones that arch-villain Thanos is always looking for, are in the hands of heroes and villains alike and all on Earth. 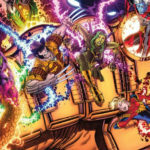 Infinity Wars #1 gives us an opportunity to see what Dr. Strange, the Avengers, and the Guardians of the Galaxy would do to ensure the Infinity Stones are separated and kept out of the hands of Thanos. The relationship between Peter Quill and Gamora is what readers should focus on. While their relationship is on and off again in the comic universe, readers can see from the opening panel, that there is a bond between the two. 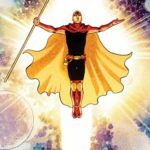 While a new Infinity Watch is gathered under the leadership of Dr. Strange, the group of heroes and misfits learn that Thanos is not what they need to worry about. Thanos will never be a problem for them because a new villain rises named Requiem. Much like Thanos, Requiem is seeking the Infinity Stones and will stop at nothing to get them. As this first issue in the new series wraps up, readers are left questioning everyone’s motives as well as where and how this series will continue. When you possess the Infinity Stones, possibilities are endless. Time, reality, and even death can be overcome. I always like it when comics start off with simple scenes that set the mood for the rest of the series. Having Infinity Wars #1 open with Peter Quill and Gamora sitting in a bar and talking was a smart move by writer Gerry Duggan. The comic series is about the Infinity Stones and to have the first page or two with simple moments of conversation lets the readers see into the future without the need of an all-powerful stone. Gamora is a fascinating character because she is the one who can turn on a dime. Kidnapped and raised by Thanos, Gamora has constantly battled for control of herself. She has been this individual character of strength and fierceness who hates her father because he is a raging lunatic, but deep down there is a little bit of love for Thanos that she hates to admit. Peter Quill is the perfect match for her because he had an unconventional childhood like Gamora. Both are looking for love but have a hard time in showing who they really are. When their relationship blossoms in past stories you see what could be of their relationship, and hope for the best. 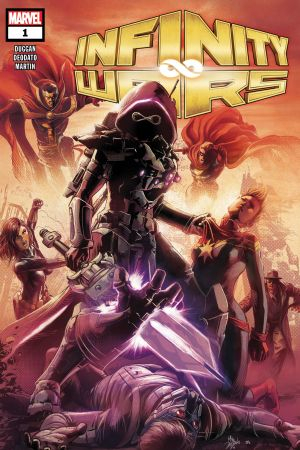 Infinity Wars #1 is not the comic that allows our heroes to ride off into the sunset. 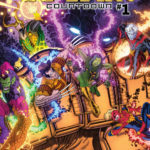 With the almighty Infinity Stones playing a central role in the evolution of this comic series, a reader must expect that the results of one week’s comic could change in the next issue. That’s where the Infinity Stones allow a writer to play with reality for our characters. Those that live this issue could be dead for the next three and then brought back to life by the end of the story. Stories that have parallel dimensions and alternate dimensions fascinate me because within the crux of one story we as the reader can explore the what if. Comic books have always allowed readers to see the possibilities while traveling through the galaxy. While the climax of this issue is filled with a large cast of people who will no doubt not be around in issue 2, I enjoyed Infinity Wars #1 for the simplicity of the Quill and Gamora’s relationship. Gamora is asking Quill to do something that he knows is wrong and so he refuses to help. Gamora takes matters into her own hands, and what the results will depend on who has control of the Infinity Stones on the last page. In this world, you can make mistakes and turn back time. 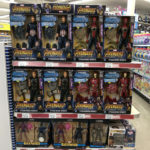 Infinity Wars #1 gets 4 Infinity Stones out of 6. While there are some standard plot points of comics past, I enjoyed the fact that writer Duggan is basing the whole story around the nucleus of Quill’s and Gamora’s relationship, and I look forward to seeing how the story plays out.